URLABARI (Morang), July 28: The flood-fed Teli Rivulet has blown away the drinking water supply pipes at Jante of Morang, keeping locals deprived of drinking water facility. 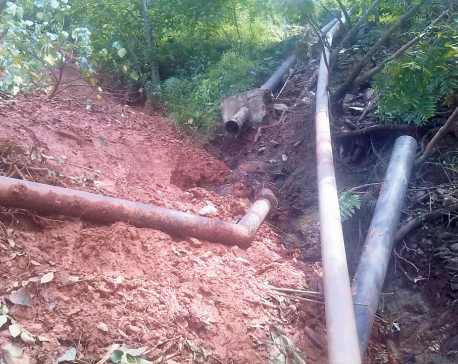 The flood triggered by downpour swept away supply pipes of the drinking water project that has been in operation since 1982. With this, around 1,000 households of the area have been deprived of using drinking water facility. Chairperson of Jante Drinking Water and Sanitation Users Committee Dilli Biswokarma shared that 1,200 households of Jante wards no 1,2,8 and 9 are reeling under drinking water crisis after the floods and landslides of July 25 took away the pipes of the water supply project.